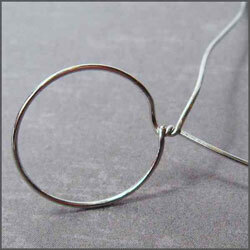 This tutorial teaches a very simple way to measure the length of wire needed for a ring shank. 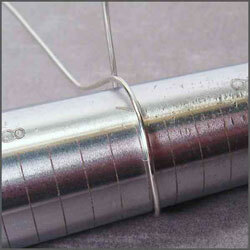 For this technique you will need to use the same gage of wire that you will use for the finished project. 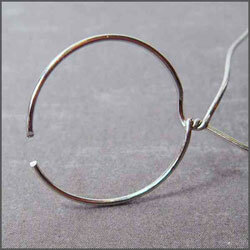 The reason for this is that different thicknesses of wire will need different lengths for the same size ring. Usually the thicker the wire, the longer the piece you will need. Wrap a piece of scrap wire (the same gage as the wire you will used in your finished project) around the ring mandrel at the size you need your finished ring to be. 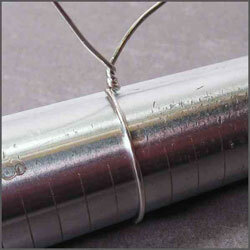 Twist the wires from each side of the mandrel together so that the loop you have made is snug against the mandrel. Be careful not to over-tighten the wire. It needs to be able to slip off the ring mandrel the same way a finished ring would slip off. Take the loop off the mandrel. Cut the wire on the side of the loop that is opposite the twist. Straighten out the wire, being careful not to loosen the twist. 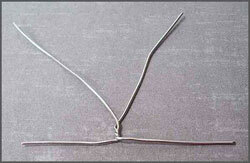 Measure the straightened wire. This is the length of wire you will need to go all the way around the ring.